You can see it in their faces, in the way they hold their ears and wag their tails. In the way they come to greet you when you’re bringing feed or overgrown cucumbers from the garden, or even just walking by on some other errand. Pigs are joyful animals. But are pigs truly joyful? What else would one call their obvious enthusiasm for life? The trouble, of course, is that saying that pigs are joyful is an anthropomorphism, an attribution of human characteristics to something non-human. We don’t actually know what they feel or why they act the way they do, even if we feel like we can. And in truth, pigs probably don’t know what they feel or why they act the way they do - at least not in the way that we think about knowing what they feel. But they’re so smart in their own way that it’s hard not to see their actions as having meaning in the same way that we as humans interpret meaning. This is not to say that they don’t have any meaning, just that it’s not human meaning. A sow that miscarries, for instance, really does seem to feel sorrow and to mourn. She goes around looking for her babies, grunting, calling, searching: it breaks your heart to watch her because she really does seem to be in distress for her little ones that she can’t find. 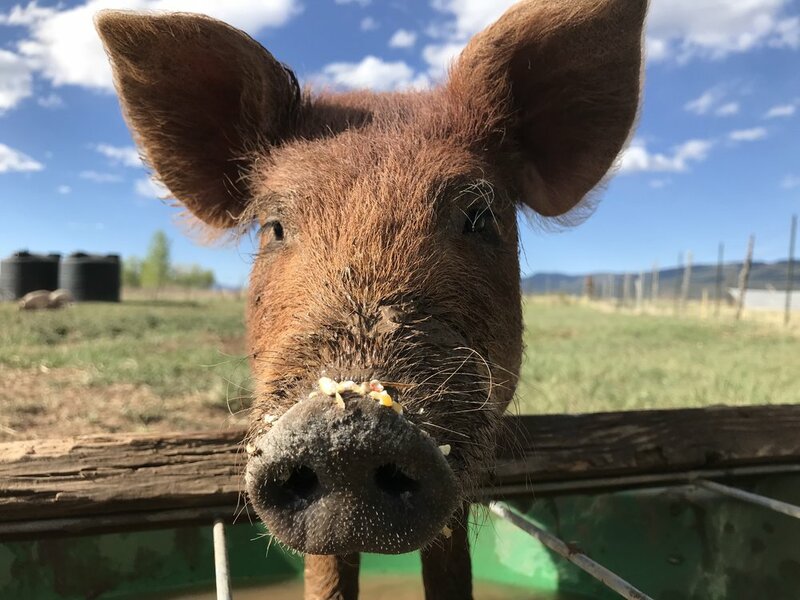 She doesn’t know (and certainly doesn’t remember) that she ate her stillborn babies with the afterbirth just minutes before beginning the search for her little piglets. But to us, her actions seem to carry pain and sorrow, especially when, weeks after her miscarriage, she’s still drawn to sit by other piglets and to act as though she wants to mother them. It breaks our hearts to watch her and makes us wish that she had some little piglets of her own to mother. Hard as it is, we must remember in those moments that we can’t know what she thinks or feels or what kind of memory (if any) she has of her pregnancy. The distress is clearly real, but it’s not anything that we, as humans, could actually understand. It’s the same unique ‘pig’ intelligence, seemingly so much like our own but at the same time completely alien, that makes pigs so personable and such delightful animals to raise - and a real challenge to manage. Pig logic is not human logic: we might expect pig logic to be our logic because the pigs really do seem to respond and understand their world in a sophisticated, humanlike way - except when they very obviously don’t. Obstacles like gates that we humans think will be a navigational hazard often are a breeze to the pigs and yet crossing a small stretch of asphalt can hold up progress for hours (yes, literally). It’s instances like these when it becomes very clear that the pigs do not perceive and experience the world in the same way that we do. I don’t mean to sound harsh or insensitive with these words: it’s very difficult for me as a person who anthropomorphizes everything from my hair dryer to the plants in the garden to comprehend and understand that my pigs do not perceive the world in the same way that I do. I see them learning and developing distinct personalities, enjoying the attention that I give them and it truly bewilders me to think that, though they may know my voice from a stranger’s, they probably don’t associate me with loyalty, love, and affection. It is my attachments and feelings that make it hard to let them go when the time comes for them to go to slaughter, not theirs. But knowing this can also be a blessing because I can know that they are not suffering (as I am) when we load them on the trailer and drop them off at the plant. Getting on the trailer with no fuss is not, to them, the ultimate betrayal of their blind, unceasing trust in me, but a result of the practice, patience, and time we’ve spent working with them so that they are easy to handle at need. And when I scratch their ears and say ‘goodbye,’ there’s no sadness - just a nice scratch on the head. So what am I confident that my pigs feel, if ‘feel’ you call it? I believe they feel now. They feel the warmth of the sun through the crisp breezes of early autumn and the physical pleasure of smelling your boots and using your leg as a scratching post. They can feel their full bellies and a comfortable place to nap in the afternoon. They feel now. And that is enough. We, as their keepers, we can be glad that we have been allowed to share a path with them for a little while in this life and to feel the joy that we see in them. To just be in the moment with them - because that’s where they are - to leave the past for a while and forget about the future and be there together. That’s what they can teach us. I love my pigs. They can teach us to be joyful.